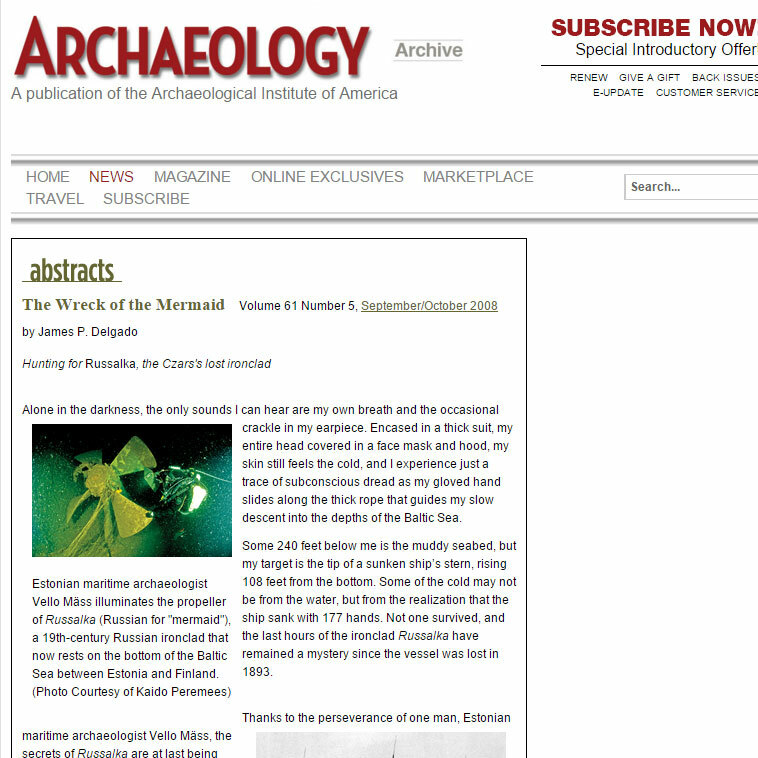 In addition to scholarly articles, Jim also writes as an archaeological journalist for several journals that reach an interested and informed readership. 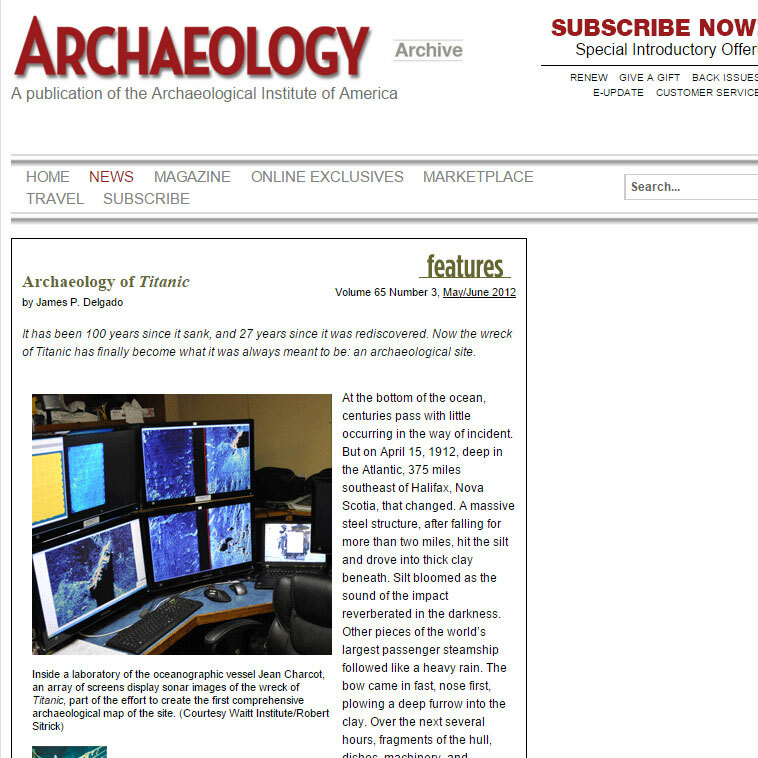 They include Archaeology magazine and Proceedings, two of his favorite magazines that reach both archaeologists and the public. Jim has been a long time contributor and friend of Archaeology magazine, a publication of the Archaeological Institute of America, with a large readership that includes the general public as well as scholars. In 2009, Jim had the distinct honor of being Master of Ceremonies at the first-ever Archaeological Institute of America Gala which celebrated their 130th anniversary as well as the 60th anniversary of Archaeology magazine. 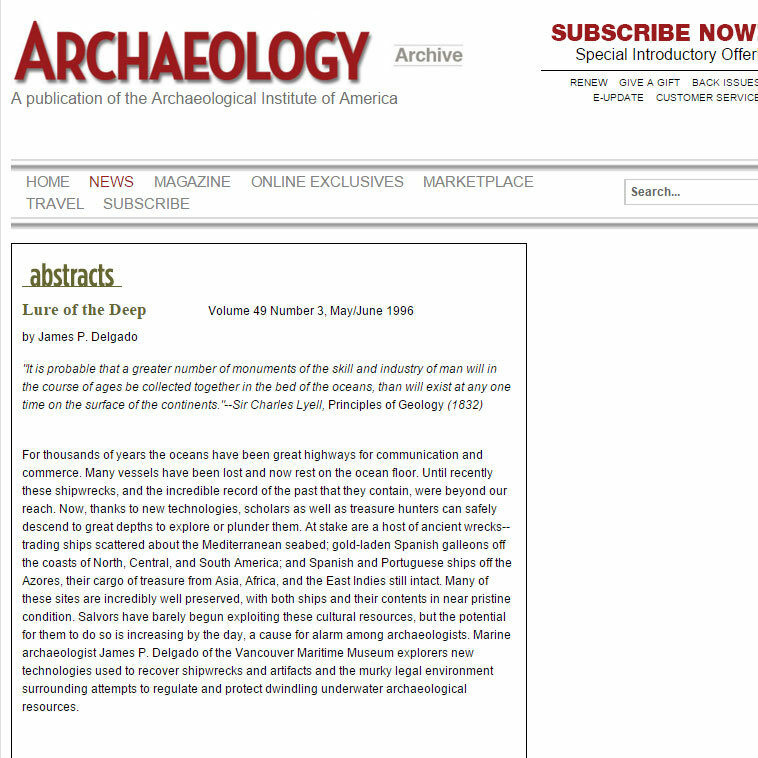 Learn more about Archaeology magazine here. Learn more about the Archaeological Institute of America here. Excerpt: In 2010 two highly sophisticated robotic vehicles systematically crisscrossed the seabed on their own, with high-resolution sonar and camera systems, creating the first comprehensive map of the Titanic site. Another robot, at the end of a fiber-optic cable, sent to the surface live, full-color, 3-D images, allowing scientists to virtually walk the decks of the ship. This latest research effort, of which I was a part, represents a paradigm shift in underwater archaeology. For the first time, Titanic can be treated and explored like any other underwater site—even extreme depth is no longer an obstacle to archaeology. Thanks to rapid technological advances and interdisciplinary work, archaeologists have a whole new perspective on sites such as Titanic, and new questions to ask, questions we never could have dreamed of when underwater archaeology began just 50 years ago. Excerpt: Bermuda is an island nation famous for its shipwrecks. Discovered in 1505 by Spanish mariner Juan de Bermudez, the tiny territory is made up of 181 small islands ringed by reefs that have claimed hundreds of vessels. It was a shipwreck, in fact, that led to the settlement of the islands. Today, Bermuda is home to more than 62,000 people, and some 150 to 300 wrecks are said to be submerged off its beaches and in its maze of reefs. Excerpts: Alone in the darkness, the only sounds I can hear are my own breath and the occasional crackle in my earpiece. Encased in a thick suit, my entire head covered in a face mask and hood, my skin still feels the cold, and I experience just a trace of subconscious dread as my gloved hand slides along the thick rope that guides my slow descent into the depths of the Baltic Sea. …Russalka lies deep, and I have only a matter of minutes to see what I can on this dive before I start a slow return to the surface. Compounding the always present risk of decompression sickness, or “the bends,” is the fact that we’re anchored in the middle of the open sea, far from land, in an active shipping lane. The wreck itself is draped with a snarl of fishing nets that can trap and drown an unwary diver. I snap on my dive light and sweep it down. The dim flash illuminates the outline of a four-bladed propeller, its bronze still shiny despite more than a century of immersion. The waters of the Baltic corrode copper alloys slowly, but then my light picks out Russalka’s massive iron rudder. The once black metal is bright orange, caked thick with rust. Glorifying treasure hunters and denigrating archaeologists is a poor apology for the destruction of our underwater heritage. 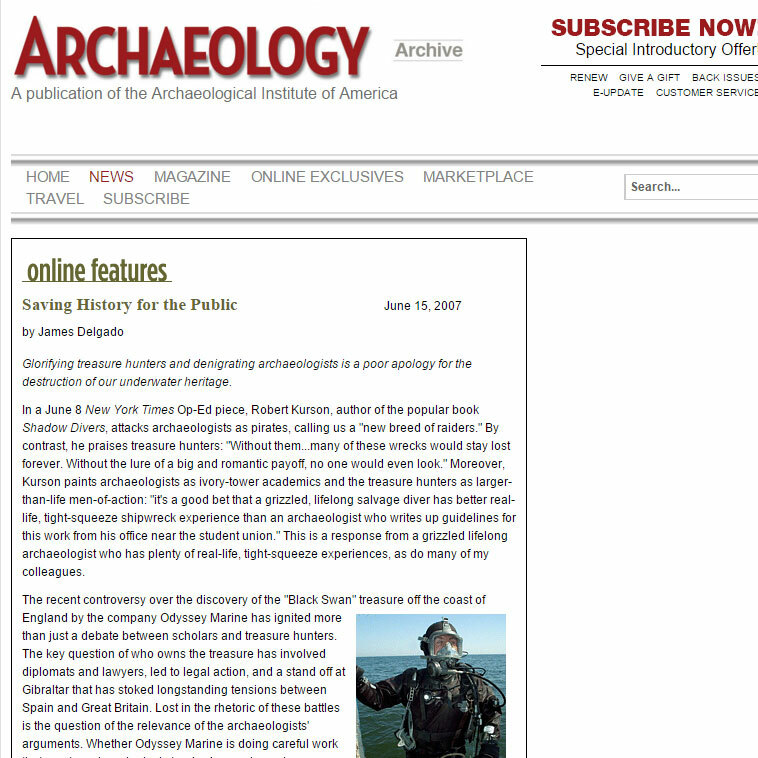 Excerpt: In a June 8 New York Times Op-Ed piece, Robert Kurson, author of the popular book Shadow Divers, attacks archaeologists as pirates, calling us a “new breed of raiders.” By contrast, he praises treasure hunters: “Without them…many of these wrecks would stay lost forever. Without the lure of a big and romantic payoff, no one would even look.” Moreover, Kurson paints archaeologists as ivory-tower academics and the treasure hunters as larger-than-life men-of-action: “it’s a good bet that a grizzled, lifelong salvage diver has better real-life, tight-squeeze shipwreck experience than an archaeologist who writes up guidelines for this work from his office near the student union.” This is a response from a grizzled lifelong archaeologist who has plenty of real-life, tight-squeeze experiences, as do many of my colleagues. 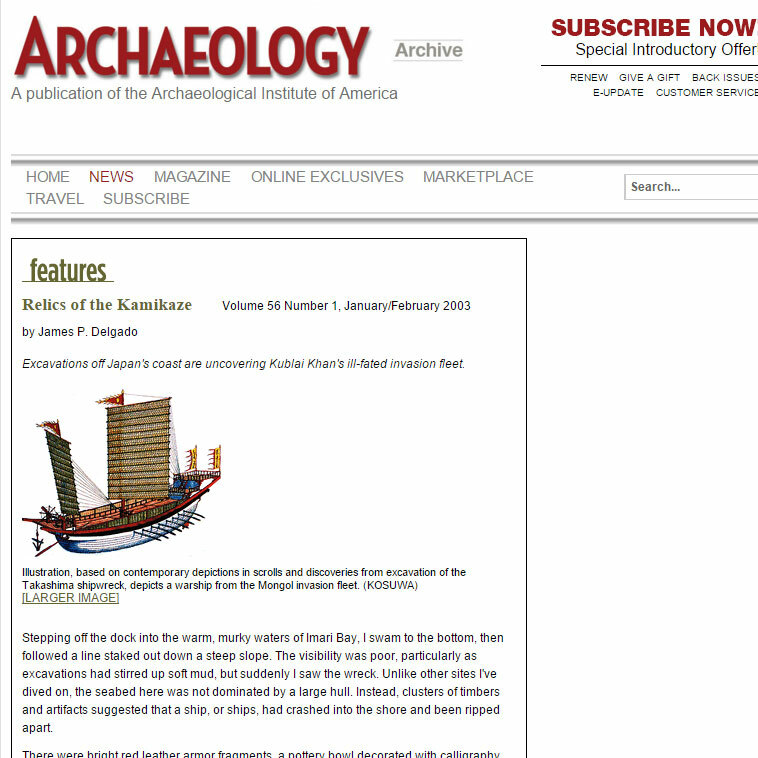 Excavations off Japan’s coast are uncovering Kublai Khan’s ill-fated invasion fleet. Excerpt: Stepping off the dock into the warm, murky waters of Imari Bay, I swam to the bottom, then followed a line staked out down a steep slope. The visibility was poor, particularly as excavations had stirred up soft mud, but suddenly I saw the wreck. Unlike other sites I’ve dived on, the seabed here was not dominated by a large hull. Instead, clusters of timbers and artifacts suggested that a ship, or ships, had crashed into the shore and been ripped apart. There were bright red leather armor fragments, a pottery bowl decorated with calligraphy, and wood with what seemed like fresh burn marks. My heart started to pound when I swam up to one object and realized it was an intact Mongol helmet. Nearby was a cluster of iron arrow tips and a round ceramic object, a tetsuhau, or bomb. Scholars had doubted whether such bombs, filled with black powder, existed this early, yet here it was. I just floated there, lost in thought that the detritus of this ancient battle lay here as fresh as if the ship had sunk yesterday, not seven centuries ago. The experience brought the story of Kublai Khan’s invasions of Japan and the kamikaze–the legendary “divine wind” said to have destroyed his fleets in 1274 and 1281–into the realm of the tangible, touchable past. An archaeologist explores the famous wreck. Excerpts: Peering through the tiny porthole, I gaze into the darkness. The minisub’s external lights illuminate a small patch of the seabed’s yellow-white silt and clay as a large rattail fish undulates across my field of vision. Suddenly a massive wall of steel looms out of the darkness. Thick orange, red, and bright yellow “rustsicles” (icicle-like formations of rust) streak down the black metal plates and onto the seafloor. I’m two and one-half miles below the North Atlantic at the bow of RMS Titanic. For thousands of years the oceans have been great highways for communication and commerce. Many vessels have been lost and now rest on the ocean floor. Until recently these shipwrecks, and the incredible record of the past that they contain, were beyond our reach. Now, thanks to new technologies, scholars as well as treasure hunters can safely descend to great depths to explore or plunder them. Jim has also been a long time contributor to Proceedings magazine. 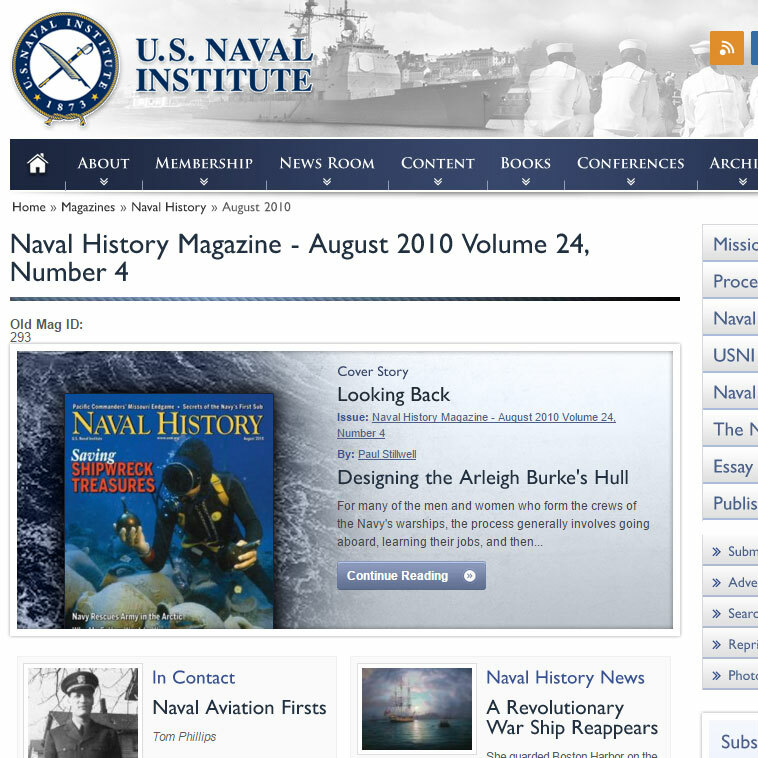 He received the Naval History Author of the Year award from the U.S. Naval Institute in 2003. Learn more about Proceedings magazine here. Learn more about the U.S. Naval Institute here. 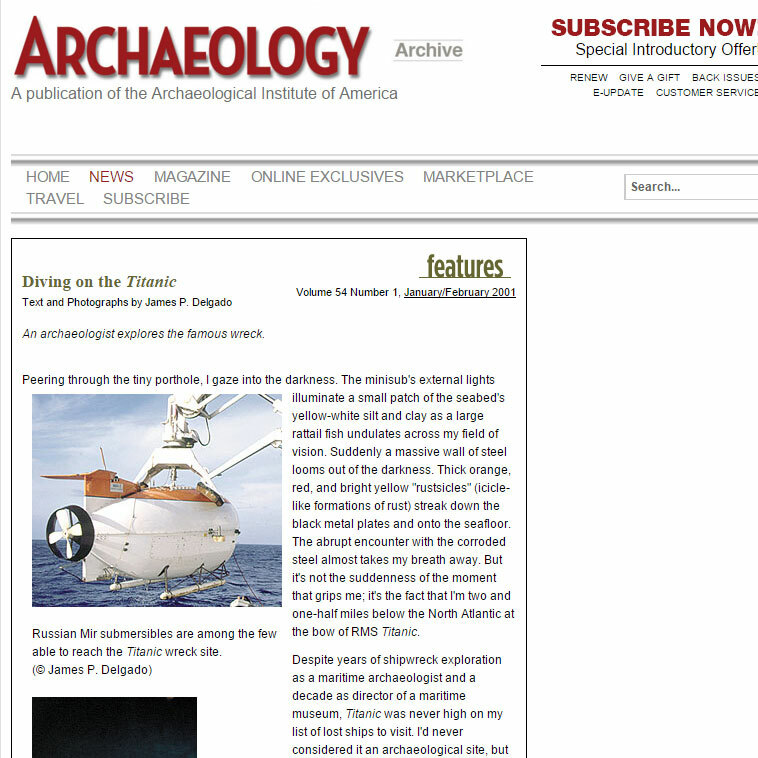 Excerpt: Since 2003, I have led successive expeditions to San Telmo resulting in a series of detailed plans of the Explorer that now resides in the Historic American Engineering Record collection in the Library of Congress, more than 300 pages of historical and archaeological documentation, two documentary films, and calls from interested parties to rescue the rusting, battered craft from the surf and place her in a museum. 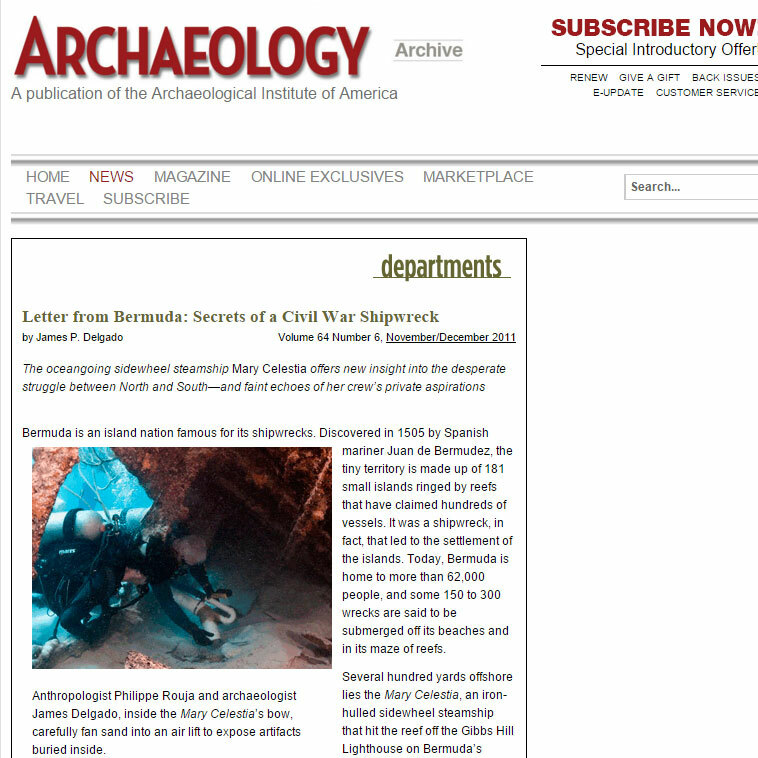 Excerpt: While news of the May 2007 discovery of the shipwreck, which Odyssey code-named the Black Swan, thrilled readers interested in treasure, it did not please the government of Spain. In November 2006 Spanish officials had met with the company at Odyssey’s request because “it desired to conduct commercial operations on shipwrecks in which Spain had historical, cultural or other interests.” Odyssey specifically asked permission to “recover and sell artifacts from such shipwrecks.” Spain refused, citing its adoption of the United Nations Educational, Scientific and Cultural Organization (UNESCO) Convention on the Protection of Underwater Cultural Heritage, which does not allow the trading, bartering, or sale of underwater cultural heritage.